The Islamic State of the West African Province (ISWAP), commonly known as Boko Haram, is one of the world’s deadliest terror groups and is waging an extremist insurgency. The violence Boko Haram has caused in Nigeria’s northeast has killed tens of thousands, displaced millions of people, damaged the country’s economy, and devastated thousands of communities. 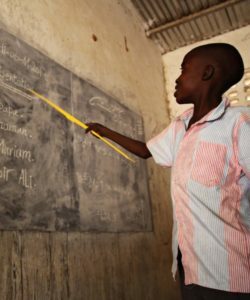 Formal education (called “Western education” by Boko Haram) has been targeted by the terrorist group, leading to the deterioration of the education system both in terms of access and quality. This is particularly true in camps for internally displaced people (IDPs). There are approximately 3 million school-aged children in need in northeast Nigeria. Over the last year, JRS has evaluated the needs in Nigeria to see where JRS is best positioned to accompany, serve, and advocate for the displaced people of the country. JRS is now in the process of opening offices in the city of Abuja, and supporting existing education projects in IDP camps in north eastern Nigeria.